“Basanta Utsav” and “Holli” redirect here. For the film, see Basanta Utsav (film). For the ice hockey player, see Antti Hölli. For other uses, see Holi (disambiguation). Holi ( /ˈhoʊliː/; Sanskrit: होली Holī) is a popular ancient Hindu festival, originating from the Indian subcontinent. It is celebrated predominantly in India and Nepal, but has also spread to other areas of Asia and parts of the Western world through the diaspora from the Indian subcontinent. Holi is popularly known as the Indian “festival of spring”, the “festival of colours”, or the “festival of love”. The festival signifies the arrival of spring, the end of winter, the blossoming of love, and for many a festive day to meet others, play and laugh, forget and forgive, and repair broken relationships. The festival also celebrates the beginning of a good spring harvest season. It lasts for a night and a day, starting on the evening of the Purnima (Full Moon day) falling in the Vikram Samvat Calendar, a Hindu calendar  month of Falgun, which falls around middle of March in the Gregorian calendar. The first evening is known as Holika Dahan (burning of demon holika) or Chhoti Holi and the following day as Holi, Rangwali Holi, Dhuleti, Dhulandi, or Phagwah. Holi is an ancient Hindu religious festival which has become popular with non-Hindus as well in many parts of South Asia, as well as people of other communities outside Asia. In Mughal India, Holi was celebrated with such exuberance that commoners of all castes could throw colour on the Emperor. In addition to India and Nepal, the festival is celebrated by Indian subcontinent diaspora in countries such as Jamaica, Suriname, Guyana, Trinidad and Tobago, South Africa, Malaysia, the United Kingdom, the United States, Canada, Mauritius, and Fiji. In recent years the festival has spread to parts of Europe and North America as a spring celebration of love, frolic, and colours. Holi celebrations start on the night before Holi with a Holika Dahan where people gather, perform religious rituals in front of the bonfire, and pray that their internal evil be destroyed the way Holika, the sister of the demon king Hiranyakashipu, was killed in the fire. The next morning is celebrated as Rangwali Holi – a free-for-all festival of colours, where people smear each other with colours and drench each other. Water guns and water-filled balloons are also used to play and colour each other. Anyone and everyone is fair game, friend or stranger, rich or poor, man or woman, children and elders. The frolic and fight with colours occurs in the open streets, open parks, outside temples and buildings. Groups carry drums and other musical instruments, go from place to place, sing and dance. People visit family, friends and foes to throw coloured powders on each other, laugh and gossip, then share Holi delicacies, food and drinks. Some customary drinks include bhang (made from cannabis), which is intoxicating. In the evening, after sobering up, people dress up and visit friends and family. There is a symbolic legend to explain why Holi is celebrated as a festival of triumph of good over evil in the honour of Hindu god Vishnu and his follower Prahlada. King Hiranyakashipu, according to a legend found in chapter 7 of Bhagavata Purana, was the king of demonic Asuras, and had earned a boon that gave him five special powers: he could be killed by neither a human being nor an animal, neither indoors nor outdoors, neither at day nor at night, neither by astra (projectile weapons) nor by any shastra (handheld weapons), and neither on land nor in water or air. Hiranyakashipu grew arrogant, thought he was God, and demanded that everyone worship only him. Hiranyakashipu’s own son, Prahlada, however, disagreed. He was and remained devoted to Vishnu. This infuriated Hiranyakashipu. He subjected Prahlada to cruel punishments, none of which affected the boy or his resolve to do what he thought was right. Finally, Holika, Prahlada’s evil aunt, tricked him into sitting on a pyre with her. Holika was wearing a cloak that made her immune to injury from fire, while Prahlada was not. As the fire roared, the cloak flew from Holika and encased Prahlada, who survived while Holika burned. Vishnu, the god who appears as an avatar to restore Dharma in Hindu beliefs, took the form of Narasimha – half human and half lion (which is neither a human nor an animal), at dusk (when it was neither day nor night), took Hiranyakashyapu at a doorstep (which was neither indoors nor outdoors), placed him on his lap (which was neither land, water nor air), and then eviscerated and killed the king with his lion claws (which were neither a handheld weapon nor a launched weapon). The Holika bonfire and Holi signifies the celebration of the symbolic victory of good over evil, of Prahlada over Hiranyakashipu, and of the fire that burned Holika. In the Braj region of India, where the Hindu deity Krishna grew up, the festival is celebrated until Rang Panchmi in commemoration of the divine love of Radha for Krishna. The festivities officially usher in spring, with Holi celebrated as a festival of love. There is a symbolic myth behind commemorating Krishna as well. As a baby, Krishna developed his characteristic dark skin colour because the she-demon Putana poisoned him with her breast milk. In his youth, Krishna despaired whether the fair-skinned Radha would like him because of his dark skin colour. His mother, tired of his desperation, asks him to approach Radha and ask her to colour his face in any colour she wanted. This she did, and Radha and Krishna became a couple. Ever since, the playful colouring of Radha and Krishna’s face has been commemorated as Holi. Beyond India, these legends help to explain the significance of Holi (Phagwah) are common in some Caribbean and South American communities of Indian origin such as Guyana and Trinidad and Tobago. It is also celebrated with great fervour in Mauritius. Among other Hindu traditions such as Shaivism and Shaktism, the legendary significance of Holi is linked to Shiva in yoga and deep meditation, goddess Parvati wanting to bring back Shiva into the world, seeks help from the Hindu god of love called Kamadeva on Vasant Panchami. The love god shoots arrows at Shiva, the yogi opens his third eye and burns Kama to ashes. This upsets both Kama’s wife Rati (Kamadevi) and his own wife Parvati. Rati performs her own meditative asceticism for forty days, upon which Shiva understands, forgives out of compassion and restores the god of love. This return of the god of love, is celebrated on the 40th day after Vasant Panchami festival as Holi. The Kama legend and its significance to Holi has many variant forms, particularly in South India. The Holi festival has a cultural significance among various Hindu traditions of the Indian subcontinent. It is the festive day to end and rid oneself of past errors, to end conflicts by meeting others, a day to forget and forgive. People pay or forgive debts, as well as deal anew with those in their lives. Holi also marks the start of spring, for many the start of the new year, an occasion for people to enjoy the changing seasons and make new friends. The Mughal Indian emperor Jahangir celebrating Holi with ladies of the zenana. The festival has traditionally been also observed by non-Hindus, such as by Jains and Newar Buddhists (Nepal). In Mughal India, Holi was celebrated with such exuberance that people of all castes could throw colour on the Emperor. According to Sharma (2017), “there are several paintings of Mughal emperors celebrating Holi”. Grand celebrations of Holi were held at the Lal Qila, where the festival was also known as Eid-e-gulaabi or Aab-e-Pashi. Mehfils were held throughout the walled city of Delhi with aristocrats and traders alike participating. Bahadur Shah Zafar himself wrote a song for the festival, while poets such as Amir Khusrau, Ibrahim Raskhan, Nazeer Akbarabadi and Mehjoor Lakhnavi relished it in their writings. Sikhs have traditionally celebrated the festival, at least through the 19th century, with its historic texts referring to it as Hola. Guru Gobind Singh – the last human guru of the Sikhs – modified Holi with a three-day Hola Mohalla extension festival of martial arts. The extension started the day after the Holi festival in Anandpur Sahib, where Sikh soldiers would train in mock battles, compete in horsemanship, athletics, archery and military exercises. Holi was observed by Maharaja Ranjit Singh and his Sikh Empire that extended across what are now northern parts of India and Pakistan. According to a report by Tribune India, Sikh court records state that 300 mounds of colours were used in 1837 by Ranjit Singh and his officials in Lahore. Ranjit Singh would celebrate Holi with others in the Bilawal gardens, where decorative tents were set up. In 1837, Sir Henry Fane who was the commander-in-chief of the British Indian army joined the Holi celebrations organised by Ranjit Singh. A mural in the Lahore Fort was sponsored by Ranjit Singh and it showed the Hindu god Krishna playing Holi with gopis. After the death of Ranjit Singh, his Sikh sons and others continued to play Holi every year with colours and lavish festivities. The colonial British officials joined these celebrations. Holi is an important spring festival for Hindus, a national holiday in India and Nepal with regional holidays in other countries. To many Hindus and some non-Hindus, it is a playful cultural event and an excuse to throw coloured water at friends or strangers in jest. It is also observed broadly in the Indian subcontinent. Holi is celebrated at the end of winter, on the last full moon day of the Hindu luni-solar calendar month marking the spring, making the date vary with the lunar cycle. [note 1] The date falls typically in March, but sometimes late February of the Gregorian calendar. The festival has many purposes; most prominently, it celebrates the beginning of Spring. In 17th century literature, it was identified as a festival that celebrated agriculture, commemorated good spring harvests and the fertile land. Hindus believe it is a time of enjoying spring’s abundant colours and saying farewell to winter. To many Hindus, Holi festivities mark the beginning of the new year as well as an occasion to reset and renew ruptured relationships, end conflicts and rid themselves of accumulated emotional impurities from the past. It also has a religious purpose, symbolically signified by the legend of Holika. The night before Holi, bonfires are lit in a ceremony known as Holika Dahan (burning of Holika) or Little Holi. People gather near fires, sing and dance. The next day, Holi, also known as Dhuli in Sanskrit, or Dhulheti, Dhulandi or Dhulendi, is celebrated. 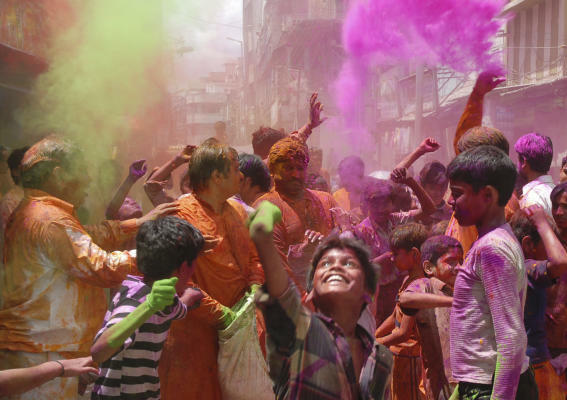 In Northern parts of India, Children and youth spray coloured powder solutions (gulal) at each other, laugh and celebrate, while adults smear dry coloured powder (abir) on each other’s faces. Visitors to homes are first teased with colours, then served with Holi delicacies (such as puranpoli, dahi-bada and gujia), desserts and drinks. After playing with colours, and cleaning up, people bathe, put on clean clothes, and visit friends and family. Like Holika Dahan, Kama Dahanam is celebrated in some parts of India. 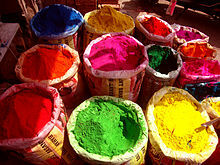 The festival of colours in these parts is called Rangapanchami, and occurs on the fifth day after Poornima (full moon). The Holi festival is an ancient Hindu festival with its cultural rituals. It is mentioned in the Puranas, Dasakumara Charita, and by the poet Kālidāsa during the 4th century reign of Chandragupta II. The celebration of Holi is also mentioned in the 7th-century Sanskrit drama Ratnavali. The festival of Holi caught the fascination of European traders and British colonial staff by the 17th century. Various old editions of Oxford English Dictionary mention it, but with varying, phonetically derived spellings: Houly (1687), Hooly (1698), Huli (1789), Hohlee (1809), Hoolee (1825), and Holi in editions published after 1910. Days before the festival people start gathering wood and combustible materials for the bonfire in parks, community centers, near temples and other open spaces. On top of the pyre is an effigy to signify Holika who tricked Prahalad into the fire. Inside homes, people stock up on pigments, food, party drinks and festive seasonal foods such as gujiya, mathri, malpuas and other regional delicacies. On the eve of Holi, typically at or after sunset, the pyre is lit, signifying Holika Dahan. The ritual symbolises the victory of good over evil. People gather around the fire to sing and dance. In North and Western India, Holi frolic and celebrations begin the morning after the Holika bonfire. There is no tradition of holding puja (prayer), and the day is for partying and pure enjoyment. Children and young people form groups armed with dry colours, coloured solution and water guns (pichkaris), water balloons filled with coloured water, and other creative means to colour their targets. Traditionally, washable natural plant-derived colours such as turmeric, neem, dhak, and kumkum were used, but water-based commercial pigments are increasingly used. All colours are used. Everyone in open areas such as streets and parks is game, but inside homes or at doorways only dry powder is used to smear each other’s face. People throw colours and get their targets completely coloured up. It is like a water fight, but with coloured water. People take delight in spraying coloured water on each other. By late morning, everyone looks like a canvas of colours. This is why Holi is given the name “Festival of Colours”. Groups sing and dance, some playing drums and dholak. After each stop of fun and play with colours, people offer gujiya, mathri, malpuas and other traditional delicacies. Cold drinks, including adult drinks based on local intoxicating herbs, are also part of the Holi festivity. In the Braj region around Mathura, in north India, the festivities may last more than a week. The rituals go beyond playing with colours, and include a day where men go around with shields and women have the right to playfully beat them on their shields with sticks. In south India, some worship and make offerings to Kaamadeva, the love god of Indian mythology. After a day of play with colours, people clean up, wash and bathe, sober up and dress up in the evening and greet friends and relatives by visiting them and exchanging sweets. Holi is also a festival of forgiveness and new starts, which ritually aims to generate harmony in the society. Holi (Hindi: होली, Marathi: होळी, Nepali: होली, Punjabi: ਹੋਲੀ, Kannada: ಹೋಳಿ, Telugu: హోళి) is also known as Phakuwa or Phagwah (Assamese: ফাকুৱা), Festival of Colours, or Dola jātra (Odia: ଦୋଳଯାତ୍ରା) in Odisha, and as Dol Jatra (Assamese: দ’ল যাত্ৰা) or Basanto utsav (“spring festival”) in West Bengal and Assam. The customs and celebrations vary between regions of India. Holi is of particular significance in the Braj region, which includes locations traditionally associated with the Lord Krishna: Mathura, Vrindavan, Nandgaon, Uttar Pradesh, and Barsana, which become touristic during the season of Holi. Outside India and Nepal, Holi is observed by the minority Hindus in Bangladesh and Pakistan as well in countries with large Indian subcontinent diaspora populations such as Suriname, Guyana, Trinidad and Tobago, South Africa, Malaysia, the United Kingdom, the United States, Canada, Australia, Mauritius, and Fiji. The Holi rituals and customs outside South Asia also vary with local adaptations. Holi, also called Phakuwa (ফাকুৱা) in Assamese, is celebrated all over Assam. Locally called Dol Jatra, associated with Satras of Barpeta, Holi is celebrated over two days. On the first day, the burning of clay huts are seen in Barpeta and lower Assam which signifies the legends of Holika. On the second day of it, Holi is celebrated with colour powders. The Holi songs in chorus devoted to Lord Krishna are also sung in the regions of Barpeta. Holi is known as Phaguwa in the local Bhojpuri dialect. In this region as well, the legend of Holika is prevalent. On the eve of Phalgun Poornima, people light bonfires. They put dried cow dung cakes, wood of the Araad or Redi tree and Holika tree, grains from the fresh harvest and unwanted wood leaves in the bonfire. At the time of Holika people assemble near the pyre. The eldest member of the gathering or a purohit initiates the lighting. He then smears others with colour as a mark of greeting. Next day the festival is celebrated with colours and a lot of frolic. Traditionally, people also clean their houses to mark the festival. Holi Milan is also observed in Bihar, where family members and well wishers visit each other’s family, apply colours (abeer) on each other’s faces, and on feet, if elderly. Usually this takes place on the evening of Holi day after Holi with wet colours is played in the morning through afternoon. Due to large-scale internal migration issues faced by the people, recently this tradition has slowly begun to transform, and it is common to have Holi Milan on an entirely different day either before or after the actual day of Holi. Children and youths take extreme delight in the festival. Though the festival is usually celebrated with colours, in some places people also enjoy celebrating Holi with water solutions of mud or clay. Folk songs are sung at high pitch and people dance to the sound of the dholak (a two-headed hand-drum) and the spirit of Holi. Intoxicating bhang, made from cannabis, milk and spices, is consumed with a variety of mouth-watering delicacies, such as pakoras and thandai, to enhance the mood of the festival. Holi is locally called Ukkuli in Konkani. It is celebrated around the Konkani temple called Gosripuram temple. It is a part of the Goan or Konkani spring festival known as Śigmo or शिगमो in Koṅkaṇī or Śiśirotsava, which lasts for about a month. The colour festival or Holi is a part of longer, more extensive spring festival celebrations. Holi festivities (but not Śigmo festivities) include: Holika Puja and Dahan, Dhulvad or Dhuli vandan, Haldune or offering yellow and saffron colour or Gulal to the deity. In Gujarat, Holi is a two-day festival. On the evening of the first day people light the bonfire. People offer raw coconut and corn to the fire. The second day is the festival of colour or “Dhuleti”, celebrated by sprinkling coloured water and applying colours to each other. Dwarka, a coastal city of Gujarat, celebrates Holi at the Dwarkadheesh temple and with citywide comedy and music festivities. Falling in the Hindu month of Phalguna, Holi marks the agricultural season of the rabi crop. In Ahmedabad in Gujarat, in western India, a pot of buttermilk is hung high over the streets and young boys try to reach it and break it by making human pyramids. 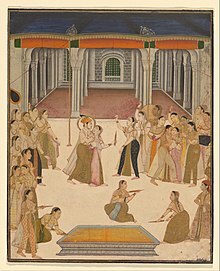 The girls try to stop them by throwing coloured water on them to commemorate the pranks of Krishna and the cowherd boys to steal butter and “gopis” while trying to stop the girls. The boy who finally manages to break the pot is crowned the Holi King. Afterwards, the men, who are now very colourful, go out in a large procession to “alert” people of Krishna’s possible appearance to steal butter from their homes. In some places there is a custom in undivided Hindu families that the woman beats her brother-in-law with a sari rolled up into a rope in a mock rage and tries to drench him with colours, and in turn, the brother-in-law brings sweets (Indian desserts) to her in the evening. In Jammu & Kashmir, Holi celebrations are much in line with the general definition of Holi celebrations: a high-spirited festival to mark the beginning of the harvesting of the summer crop, with the throwing of coloured water and powder and singing and dancing. Traditionally, in rural Karnataka children collect money and wood in the weeks prior to Holi, and on “Kamadahana” night all the wood is put together and lit. The festival is celebrated for two days. People in northern parts of Karnataka prepare special food on this day. In Sirsi, Karnataka, Holi is celebrated with a unique folk dance called “Bedara Vesha”, which is performed during the nights beginning five days before the actual festival day. The festival is celebrated every alternate year in the town, which attracts a large number of tourists from different parts of the India. In Maharashtra, Holi Purnima is also celebrated as Shimga, festivities that last five to seven days. A week before the festival, youngsters go around the community, collecting firewood and money. On the day of Shimga, the firewood is heaped into a huge pile in each neighborhood. In the evening, the fire is lit. Every household brings a meal and dessert, in the honour of the fire god. Puran Poli is the main delicacy and children shout “Holi re Holi puranachi poli”. Shimga celebrates the elimination of all evil. The colour celebrations here take place on the day of Rang Panchami, five days after Shimga. During this festival, people are supposed to forget and forgive any rivalries and start new healthy relations with all. Manipuris celebrate Holi for 6 days. Here, this holiday merges with the festival of Yaosang. Traditionally, the festival commences with the burning of a thatched hut of hay and twigs. Young children go from house to house to collect money, locally known as nakadeng (or nakatheng), as gifts on the first two days. The youths at night perform a group folk dance called Thabal chongba on the full moon night of Lamta (Phalgun), traditionally accompanied by folk songs and rhythmic beats of the indigenous drum, but nowadays by modern bands and fluorescent lamps. In Krishna temples, devotees sing devotional songs, perform dances and celebrate with aber (gulal) wearing traditional white and yellow turbans. On the last day of the festival, large processions are taken out to the main Krishna temple near Imphal where several cultural activities are held. In recent decades, Yaosang, a type of Indian sport, has become common in many places of the valley, where people of all ages come out to participate in a number of sports that are somewhat altered for the holiday. An 1822 drawing showing elevation of a black stone arch in Puri, Odisha. It carried Vaishnavite gods and goddess, the ritual noted to be a part of the Holi festival. The people of Odisha celebrate “Dola” on the day of Holi where the icons of Jagannath replace the icons of Krishna and Radha. Dola Melana, processions of the deities are celebrated in villages and bhoga is offered to the deities. “Dola yatra” was prevalent even before 1560 much before Holi was started where the idols of Jagannath, Balabhadra and Subhadra used to be taken to the “Dolamandapa” (podium in Jagannath temple). People used to offer natural colours known as “abira” to the deities and apply on each other’s feats. In Punjab, the eight days preceding Holi are known as luhatak. Sekhon (2000) states that people start throwing colours many days before Holi. Holi is preceded by Holika Dahan the night before when a fire is lit. Historically, the Lubana community of Punjab celebrated holi “with great pomp and show. The Lubanas buried a pice and betel nut. They heaped up cow-dung cakes over the spot and made a large fire. When the fire had burnt out, they proceeded to hunt for the pice and betel-nut. Whosoever found these, was considered very lucky.” Elsewhere in Punjab, Holi was also associated with making fools of others. Bose writing in Cultural Anthropology: And Other Essays in 1929 noted that “the custom of playing Holi-fools is prevalent in Punjab”. On the day of Holi, people engage in throwing colours on each other. For locals, Holi marks the end of winter. The Punjabi saying ‘Phaggan phal laggan’ (Phagun is the month for fructifying) exemplifies the seasonal aspect of Holi. Trees and plants start blossoming from the day of Basant and start bearing fruit by Holi. During Holi in Punjab, walls and courtyards of rural houses are enhanced with drawings and paintings similar to rangoli in South India, mandana in Rajasthan, and rural arts in other parts of India. This art is known as chowk-poorana or chowkpurana in Punjab and is given shape by the peasant women of the state. In courtyards, this art is drawn on cloth. The art includes drawing tree motifs, flowers, ferns, creepers, plants, peacocks, palanquins, geometric patterns along with vertical, horizontal and oblique lines. These arts add to the festive atmosphere. Folk theatrical performances known as swang or nautanki take place during Holi, with the latter originating in the Punjab. According to Self (1993), Holi fairs are held in the Punjab which may go on for many days. Bose (1961) states that “in some parts of the Punjab, holi is celebrated with wrestling matches”. As in other parts of India, in rural Telangana, children celebrate kamuda and collect money, rice, corn and wood for weeks prior to Holi, and on Kamudha night all the wood is put together and set on fire. In the Braj region of North India, women have the option to playfully hit men who save themselves with shields; for the day, men are culturally expected to accept whatever women dish out to them. This ritual is called Lath Mar Holi. Barsana, a town near Mathura in the Braj region of Uttar Pradesh, celebrates Lath mar Holi in the sprawling compound of the Radha Rani temple. Thousands gather to witness the Lath Mar Holi when women beat up men with sticks as those on the sidelines become hysterical, sing Holi songs and shout “Sri Radhey” or “Sri Krishna”. The Holi songs of Braj mandal are sung in pure Braj, the local language. Holi celebrated at Barsana is unique in the sense that here women chase men away with sticks. Males also sing provocative songs in a bid to invite the attention of women. Women then go on the offensive and use long staves called lathis to beat the men, who protect themselves with shields. Mathura, in the Braj region, is the birthplace of Lord Krishna. In Vrindavan this day is celebrated with special puja and the traditional custom of worshipping Lord Krishna; here the festival lasts for sixteen days. All over the Braj region  and neighboring places like Hathras, Aligarh, and Agra, Holi is celebrated in more or less the same way as in Mathura, Vrindavan and Barsana. A play of colours then a dance at a Hindu temple near Mathura, at Holi. A traditional celebration includes Matki Phod, similar to Dahi Handi in Maharashtra and Gujarat during Krishna Janmashtami, both in the memory of god Krishna who is also called makhan chor (literally, butter thief). This is a historic tradition of the Braj region as well as the western region of India. An earthen pot filled with butter or other milk products is hung high by a rope. Groups of boys and men climb on each other’s shoulders to form pyramids to reach and break it, while girls and women sing songs and throw coloured water on the pyramid to distract them and make their job harder. This ritual sport continues in Hindu diaspora communities. Outside Braj, in the Kanpur area, Holi lasts seven days with colour. On the last day, a grand fair called Ganga Mela or the Holi Mela is celebrated. This Mela (fair) was started by freedom fighters who fought British rule in the First Indian War of Independence in 1857 under the leadership of Nana Saheb. The Mela is held at various ghats along the banks of the River Ganga in Kanpur, to celebrate the Hindus and Muslims who together resisted the British forces in the city in 1857. On the eve of Ganga Mela, all government offices, shops, and courts generally remain closed. The Ganga Mela marks the official end of “The Festival of Colours” or Holi in Kanpur. In Gorakhpur, the northeast district of Uttar Pradesh, the day of Holi starts with a special puja. This day, called “Holi Milan”, is considered to be the most colourful day of the year, promoting brotherhood among the people. People visit every house and sing Holi songs and express their gratitude by applying coloured powder (Abeer). It is also considered the beginning of the year, as it occurs on the first day of the Hindu calendar year (Panchang). Kumaoni Holi in Uttarakhand includes a musical affair. It takes different forms such as the Baithki Holi, the Khari Holi and the Mahila Holi. In Baithki Holi and Khari Holi, people sing songs with a touch of melody, fun and spiritualism. These songs are essentially based on classical ragas. Baithki Holi (बैठकी होली), also known as Nirvan Ki Holi, begins from the premises of temples, where Holiyars (होल्यार) sing Holi songs and people gather to participate, along with playing classical music. The songs are sung in a particular sequence depending on the time of day; for instance, at noon the songs are based on Peelu, Bhimpalasi and Sarang ragas, while evening songs are based on the ragas such as Kalyan, Shyamkalyan and Yaman. The Khari Holi (खड़ी होली) is mostly celebrated in the rural areas of Kumaon. The songs of the Khari Holi are sung by the people, who, sporting traditional white churidar payajama and kurta, dance in groups to the tune of ethnic musical instruments such as the dhol and hurka. 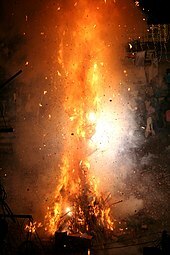 In the Kumaon region, the Holika pyre, known as Cheer (चीर), is ceremonially built in a ceremony known as Cheer Bandhan (चीर बंधन) fifteen days before Dulhendi. The Cheer is a bonfire with a green Paiya tree branch in the middle. The Cheer of every village and neighborhood is rigorously guarded as rival mohallas try to playfully steal each other’s cheer. The colours used on Holi are derived from natural sources. Dulhendi, known as Charadi (छरड़ी) (from Chharad (छरड़)), is made from flower extracts, ash and water. Holi is celebrated with great gusto much in the same way all across North India. In West Bengal, Holi is known by the name of “Dol Jatra”, “Dol Purnima” or the “Swing Festival”. The festival is celebrated in a dignified manner by placing the icons of Krishna and Radha on a picturesquely decorated palanquin which is then taken round the main streets of the city or the village. On the Dol Purnima day in the early morning, students dress up in saffron-coloured or pure white clothes and wear garlands of fragrant flowers. They sing and dance to the accompaniment of musical instruments, such as the ektara, dubri, and veena. The devotees take turns to swing them while women dance around the swing and sing devotional songs. During these activities, the men keep spraying coloured water and coloured powder, abir, at them. celebrate the festival with their Hindu friends. Traditional concerts are held in most cities in Nepal, including Kathmandu, Narayangarh, Pokhara, Itahari, Hetauda, and Dharan, and are broadcast on television with various celebrity guests. People walk through their neighbourhoods to celebrate Holi by exchanging colours and spraying coloured water on one another. A popular activity is the throwing of water balloons at one another, sometimes called lola (meaning water balloon). Many people mix bhang in their drinks and food, as is also done during Shivaratri. It is believed that the combination of different colours at this festival takes all sorrow away and makes life itself more colourful. Over the years, Holi has become an important festival in many regions wherever Indian diaspora were either taken as indentured labourers during colonial era, or where they emigrated on their own, and are now present in large numbers such as in Africa, North America, Europe, Latin America, and parts of Asia such as Fiji. Holi is a national holiday in Suriname. It is called Phagwa festival, and is celebrated to mark the beginning of spring and Hindu mythology. In Suriname, Holi Phagwa is a festival of colour. It is customary to wear old white clothes on this day, be prepared to get them dirty and join in the colour throwing excitement and party. Phagwa is normally celebrated in Trinidad and Tobago on the Sunday closest to the actual date of Phagwah. It is celebrated with a lot of colour and splendour, along with the singing on traditional Phagwah songs or Chowtal (gana). Phagwah is a national holiday in Guyana, and peoples of all races and religions participate in the celebrations. The main celebration in Georgetown is held at the Mandir in Prashad Nagar. Indo-Fijians celebrate Holi as festival of colours, folksongs and dances. The folksongs sung in Fiji during Holi season are called phaag gaaian. Phagan, also written as Phalgan, is the last month of the Hindu calendar. Holi is celebrated at the end of Phagan. Holi marks the advent of spring and ripening of crops in Northern India. Not only it is a season of romance and excitement, folk songs and dances, it is also an occasion of playing with powder, perfumes and colours. Many of the Holi songs in Fiji are around the theme of love-relationship between Radha and Krishna. Holi in Mauritius comes close on the heels of Shivaratri. It celebrates the beginning of spring, commemorating good harvests and the fertile land. Hindus believe it is a time of enjoying spring’s abundant colours and saying farewell to winter. It is considered one of the most exhilarating religious holidays in existence. During this event, participants hold a bonfire, throw coloured powder at each other, and celebrate wildly. Holi is celebrated in many US states. It is usually hosted in temples or cultural halls. Members of Hindu associations and volunteers assist in hosting the event along with temple devotees. Some of the places known to celebrate Holi are New Brunswick (NJ), Spanish Fork (Utah), Houston (TX), Dallas (TX), South El Monte (CA), Boston (MA), Potomac (MD), and Chicago (IL). In Indonesia, Indian Indonesians and Hindu peoples celebrate Holi as festival of colours. The main celebrations in Medan and Bali. Holi is celebrated by the minority Hindu population in Pakistan. Community events by Hindus have been reported by Pakistani media in various cities such as Karachi, Hazara, Rawalpindi, Sindh, Hyderabad, Multan and Lahore. Holi was not a public holiday in Pakistan from 1947 to 2016. Holi along with Diwali for Hindus, and Easter for Christians, was adopted as public holiday resolution by Pakistan’s parliament in 2016, giving the local governments and public institutions the right to declare Holi as a holiday and grant leave for its minority communities, for the first time. This decision has been controversial, with some Pakistanis welcoming the decision, while others criticising it, with the concern that declaring Holi a public holiday advertises a Hindu festival to Pakistani children. Holi snacks and drinks, post play with colours. Left: salty snacks, Middle: Gujia (a stuffed wrap), Right: Thandai (almonds-based chilled drink) to which sometimes intoxicating “bhang” is added. Friends form groups on Holi, play drums and music, sing and dance, as they move from one stop to another. A 2007 study found that malachite green, a synthetic bluish-green dye used in some colours during Holi festival, was responsible for severe eye irritation in Delhi, if eyes were not washed upon exposure. Though the study found that the pigment did not penetrate through the cornea, malachite green is of concern and needs further study. These reports have galvanised a number of groups into promoting more natural celebrations of Holi. Development Alternatives, Delhi and Kalpavriksh, – Kalpavriksh Environment Action Group, Pune, The CLEAN India campaign and Society for Child Development, through its Avacayam Cooperative Campaign have launched campaigns to help children learn to make their own colours for Holi from safer, natural ingredients. Meanwhile, some commercial companies such as the National Botanical Research Institute have begun to market “herbal” dyes, though these are substantially more expensive than the dangerous alternatives. However, it may be noted that many parts of rural India have always resorted to natural colours (and other parts of festivities more than colours) due to availability. In urban areas, some people wear nose mask and sun glasses to avoid inhaling pigments and to prevent chemical exposure to eyes. An alleged environmental issue related to the celebration of Holi is the traditional Holika bonfire, which is believed to contribute to deforestation. Activists estimate Holika causes 30,000 bonfires every year, with each one burning approximately 100 kilograms (220.46 lbs) of wood. This represents less than 0.0001% of 350 million tons of wood India consumes every year, as one of the traditional fuels for cooking and other uses. The use of heavy metal-based pigments during Holi is also reported to cause temporary wastewater pollution, with the water systems recovering to pre-festival levels within 5 days. In June 2015, hundreds of concert-goers in Bali District, Taiwan were severely injured in the Formosa Fun Coast explosion, including fifteen who died later in hospital, after three tons of corn starch powder mixed with food colouring was sprayed onto the crowd at a high velocity, causing a massive explosion. During traditional Holi celebrations in India, Rinehart writes, colours are exchanged in person by “tenderly applying coloured powder to another person’s cheek”, or by spraying and dousing others with buckets of coloured water. Holi is celebrated as a social event in parts of the United States. For example, at Sri Sri Radha Krishna Temple in Spanish Fork, Utah, NYC Holi Hai in Manhattan, New York and Festival of Colors: Holi NYC in New York City, New York, Holi is celebrated as the Festival of Color, where thousands of people gather from all over the United States, play and mingle. There have been concerns that these events appropriate and trivialise aspects of Holi for commercial gain—downplaying or completely ignoring the cultural and spiritual roots of the celebration. Organisers of these events have argued that the costs are to cover various key aspects of their events, such as safe colour powders, safety and security, and entertainment. ^ a b Since ancient times, the Indian subcontinent has had several major Hindu calendars, which places Holi and other festivals on different local months even though they mean the same date. Some Hindu calendars emphasise the solar cycle, some the lunar cycle. Further, the regional calendars feature two traditions of Amanta and Purnimanta systems, wherein the similar sounding months refer to different parts of a lunar cycle, thus further diversifying the nomenclature. The Hindu festival of Holi falls on the first (full moon) day of Chaitra lunar month’s dark fortnight in the Purnimanta system, while the same exact day for Holi is expressed in Amanta system as the lunar day of Phalguna Purnima. Both time measuring and dating systems are equivalent ways of meaning the same thing, they continue to be in use in different regions. In regions where the local calendar places it in its Phalguna month, Holi is also called Phaguwa. ^ a b The New Oxford Dictionary of English (1998) ISBN 0-19-861263-X – p.874 “Holi /’həʊli:/ noun a Hindu spring festival …”. ^ a b Kristi L. Wiley (2009). The A to Z of Jainism. Scarecrow. p. 42. ISBN 978-0-8108-6337-8. ^ a b Bal Gopal Shrestha (2012). The Sacred Town of Sankhu: The Anthropology of Newar Ritual, Religion and Society in Nepal. Cambridge Scholars Publishing. pp. 269–271, 240–241. ISBN 978-1-4438-3825-2. ^ a b Lyford, Chris (5 April 2013). “Hindu spring festivals increase in popularity and welcome non-Hindus”. The Washington Post. New York City. Retrieved 23 February 2016. Despite what some call the reinvention of Holi, the simple fact that the festival has transcended cultures and brings people together is enough of a reason to embrace the change, others say. In fact, it seems to be in line with many of the teachings behind Holi festivals. ^ “Holidays in India, Month of March 2017”. Government of India. Retrieved 18 March 2016. ^ “Celebrate Holi! Nepal’s Most Colorful Festival”. 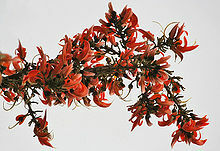 HimalayanWonders.Com. 16 March 2015. ^ “About Holi – Dhuleti Colorful Spring Festival”. Holi Dhuleti Celebrations. ^ Helen Myers (1998). Music of Hindu Trinidad: Songs from the India Diaspora. University of Chicago Press. p. 430. ISBN 978-0-226-55453-2. ^ a b c d e Safvi, Rana (23 March 2016). “In Mughal India, Holi was celebrated with the same exuberance as Eid”. Scroll.in. Retrieved 22 March 2019. ^ Amber Wilson (2004). Jamaica: The people. Crabtree Publishing Company. p. 18. ISBN 978-0-7787-9331-1. ^ a b Victoria Williams (2016). Celebrating Life Customs around the World. ABC-CLIO. p. 75. ISBN 978-1-4408-3659-6. ^ Ayyagari, Shalini (2007). ““Hori Hai”: A Festival of Colours!! (review)”. Asian Music. Johns Hopkins University Press. 38 (2): 151–153. doi:10.1353/amu.2007.0029. ^ a b “High on Holi with bhang”. The Times of India. Retrieved 26 March 2014. ^ David N. Lorenzen (1996). Praises to a Formless God: Nirguni Texts from North India. State University of New York Press. pp. 22–31. ISBN 978-0-7914-2805-4. Sunil Kothari; Avinash Pasricha (2001). Kuchipudi. Abhinav. pp. 66–67. ISBN 978-81-7017-359-5. ^ Roshen Dalal (2010). Hinduism: An Alphabetical Guide. Penguin Books India. p. 275. ISBN 978-0-14-341421-6. ^ a b c Holi – the festival of colours Archived 1 February 2016 at the Wayback Machine The Indian Express. ^ Robin Rinehart (2004). Contemporary Hinduism: Ritual, Culture, and Practice. ABC-CLIO. pp. 135–137. ISBN 978-1-57607-905-8. ^ Michelle Lee (2016). Holi. Scobre. pp. 8–11. ISBN 978-1-62920-572-4. ^ Usha Sharma (2008). Festivals In Indian Society. Mittal Publications. pp. 80–82. ISBN 978-81-8324-113-7. ^ W. H. McLeod (2009). The A to Z of Sikhism. Scarecrow Press. p. 95. ISBN 978-0-8108-6344-6. ^ Christian Roy (2005). Traditional Festivals: A Multicultural Encyclopedia. ABC-CLIO. pp. 192–193. ISBN 978-1-57607-089-5. ^ James K. Wellman Jr.; Clark Lombardi (2012). Religion and Human Security: A Global Perspective. Oxford University Press. pp. 112 note 18. ISBN 978-0-19-982775-6. ^ Nikky-Guninder Kaur Singh (2011). Sikhism: An Introduction. I.B.Tauris. pp. 93–94. ISBN 978-1-84885-321-8. ^ Peter J. Claus; Sarah Diamond; Margaret Ann Mills (2003). South Asian Folklore: An Encyclopedia : Afghanistan, Bangladesh, India, Nepal, Pakistan, Sri Lanka. Taylor & Francis. p. 552. ISBN 978-0-415-93919-5. ^ a b Christopher John Fuller (2004). The Camphor Flame: Popular Hinduism and Society in India. Princeton University Press. pp. 291–293. ISBN 978-0-69112-04-85. ^ Nachum Dershowitz; Edward M. Reingold (2008). Calendrical Calculations. Cambridge University Press. pp. 123–133, 275–311. ISBN 978-0-521-88540-9. ^ Javier A. Galván (2014). They Do What? A Cultural Encyclopedia of Extraordinary and Exotic Customs from around the World. ABC-CLIO. pp. 137–138. ISBN 978-1-61069-342-4. ^ J. Gordon Melton; Martin Baumann (2010). Religions of the World: A Comprehensive Encyclopedia of Beliefs and Practices, 2nd Edition. ABC-CLIO. pp. 1337–1338. ISBN 978-1-59884-204-3. ^ Andrew Smith (2013). The Oxford Encyclopedia of Food and Drink in America. Oxford University Press. p. 185. ISBN 978-0-19-973496-2. ^ Religions – Hinduism: Holi. BBC. Retrieved 21 March 2011. ^ “Holi 2014: Festival Of Colors Celebrates Spring (SONGS, PHOTOS)”. The Huffington Post. Retrieved 17 March 2014. ^ Guṅe, Viṭhṭhala Triṃbaka (1979). Gazetteer of the Union Territory Goa, Daman and Diu: district. 1. Goa, Daman and Diu (India). Gazetteer Dept. p. 263. ^ “You are being redirected…” www.pndwarka.com. ^ “Karnataka”. The Hindu. 10 March 2009. Retrieved 23 September 2013. ^ “Elevation of the black stone arch”. V&A: Search the Collections. Victoria and Albert Museum. Retrieved 10 April 2016. Object history note: The arch is covered with figures of Vaishnavite gods and hung with rings. A crowd of Hindus are celebrating the festival of the Dol Jatra or Swing festival in which the image of Vishnu and his consort are swung in a throne suspended by chains from the rings of the arch. The celebration is part of the Holi festival and takes place at the full moon of the month of Phalguna (February to March). ^ Dipti Ray (2007). Prataparudradeva, the Last Great Suryavamsi King of Orissa (A.D. 1497 to A.D. 1540). Northern Book Centre. pp. 90–. ISBN 978-81-7211-195-3. ^ Biswamoy Pati (1 January 2001). Situating Social History: Orissa, 1800-1997. Orient Blackswan. pp. 74–. ISBN 978-81-250-2007-3. ^ Census of India, 1961: Punjab. Manager of Publications. ^ M. Arunachalam (1980). Festivals of Tamil Nadu. Gandhi Vidyalayam. pp. 242–244. ^ K. Gnanambal (1947). Home Life Among the Tamils in the Sangam Age. Central Art Press. p. 98. ^ G. Rajagopal (2007). Beyond Bhakti: Steps Ahead. B.R. Publishing. p. 75. ISBN 978-81-7646-510-6. ^ “Holi in Tamil Nadu”. holifestival.org. Retrieved 16 March 2017. ^ “So drop colors – Holi, Brij Lal was”. jagran. 19 March 2014. ^ David Gellner (2009). Ethnic Activism and Civil Society in South Asia. SAGE Publications. pp. 27–29. ISBN 978-81-321-0422-3. ^ Kumaoni Holi – Uttaranchal Fairs and Festivals. Euttaranchal.com. Retrieved 21 March 2011. ^ a b William Brook Northey; C. J. Morris (2001). The Gurkhas: Their Manners, Customs, and Country. Asian Educational Services. pp. 79–80. ISBN 978-81-206-1577-9. ^ Bal Gopal Shrestha (2012). The Sacred Town of Sankhu: The Anthropology of Newar Ritual, Religion and Society in Nepal. Cambridge Scholars Publishing. pp. 269, 240–241, 283–284. ISBN 978-1-4438-3825-2. ^ Happy Holi week Archived 23 January 2011 at the Wayback Machine. Nepali Times. Retrieved 21 March 2011. ^ Smock, Kirk, Guyana: the Bradt Travel Guide, 2007, p. 24. ^ “Warna-warni Festival Holi di Denpasar Bali”. kumparan. ^ Velpandian, T.; Saha, K.; Ravi, A.K. ; Kumari, S.S.; Biswas, N.R. ; Ghose, S. (2007). “Ocular hazards of the colors used during the festival-of-colors (Holi) in India—Malachite green toxicity”. Journal of Hazardous Materials. 139 (2): 204–208. doi:10.1016/j.jhazmat.2006.06.046. PMID 16904259. ^ “The safe Holi campaign”. Archived from the original on 26 March 2007. ^ “CLEAN India campaign”. Archived from the original on 23 April 2013. ^ “Society For Child Development”. Sfcdindia.org. Retrieved 23 September 2013. ^ “No real attempt to save trees”. The Times of India. 17 March 2003. ^ “Months after water park fire, 15th burn victim dies”. Focus Taiwan News Channel. 29 November 2015. Retrieved 28 December 2015. ^ Forsythe, Michael. “Hundreds Treated for Burns After Fire at Taiwan Water Park”. The New York Times. Retrieved 29 June 2015. ^ Angelo Young. “Taiwan Water Park Explodes, Injuring At Least 229 People Attending A ‘Color Play’ Party; Dust Explosion Was Likely Cause”. International Business Times. Retrieved 11 July 2015. ^ “Heavy dust, heat source may have caused explosion, says official”. The China Post, Taiwan. 30 June 2015. Retrieved 11 July 2015. ^ “Water Park Inferno: Details of pre-blaze conditions emerge”. Taipei Times. 30 June 2015. Retrieved 12 July 2015. ^ a b c “When Powders Turn Deadly”. Asia One. Retrieved 11 July 2015. ^ Williamson, George (2002). “Introduction to Dust Explosions”. Archived from the original on 23 December 2004. Retrieved 29 October 2006. ^ Williamson, George (2002). “Introduction to Dust Explosions — concentration range”. Archived from the original on 23 December 2004. Retrieved 29 October 2006. ^ Rinehart, Robin (2004). Contemporary Hinduism ritual, culture, and practice. p. 137. ISBN 978-1-57607-905-8. ^ “Holi Moli UNCUNC Global”. global.unc.edu. ^ “2015 Cape Town We Are One Colour Festival – Holi Festivals, Live Music Concerts & Events South Africa”. ^ “Phagwah Parade, Richmond Hills, Queens”. H.P.F.C ANNUAL PHAGWAH PARADE. ^ a b c “Festival of Colors – Holi NYC 2016”. Festival of Colors: Holi NYC. ^ “NYC Holi Hai 2016”. NYC Holi Hai 2016. ^ Spinelli, Lauren; Editors, Time Out (9 May 2015). “Check out the multi-colored fun at this year’s Holi party”. Time Out New York. New York City. Archived from the original on 14 May 2015. Retrieved 23 February 2016. Ker-pow! Just when you thought spring couldn’t look any more spectacular, Brooklyn hosted its annual Festival of Colors celebration at the Cultural Performing Arts Center (May 9). Partygoers flung paint powder around with gleeful abandon while grooving the day and night away, and as you’ll see from our photos, this year’s bash was one of the most gloriously messy spring events in NYC. ^ Muncy, C.S. (4 May 2014). “PORTRAITS FROM HOLI NYC”. The Village Voice. New York City. Archived from the original on 1 August 2015. Retrieved 23 February 2016. Holi Hai, also known as the Festival of Colors, celebrates the coming of spring, the joy of friendship, and equality for all. Held on Saturday, May 3, 2014 at the Yard @ C-PAC (Cultural Performing Arts Center) in Brooklyn, thousands of participants joined in to dance and generally cover each other in colored powder. The powders used in Holi represent happiness, love, and the freedom to live vibrantly. ^ “Welcome to HOLI ONE”. Holi One. Birmingham, England. Retrieved 21 October 2016. Thousands of people, dressed in white, come together to share in music, dance, performance art and visual stimulation. Holi One brings this unforgettable experience to cities all around the world. ^ “Color Me Rad 5K Run”. SanJose.com. Retrieved 6 March 2015. ^ a b “Hindu Holi festival shows its colours in UK”. Al Jazeera. Retrieved 6 March 2015. ^ a b c “A Spring Celebration of Love Moves to the Fall—and Turns Into a Fight”. The Wall Street Journal. Retrieved 6 March 2015. ^ “Oboji svoje ljeto uz BiH Color Festival 28. i 29. jula u Brčkom” (in Bosnian). 6yka.com. 13 July 2017. ^ “BiH Color Festival po drugi put u Brčkom” (in Bosnian). otisak.ba. 25 July 2017. Retrieved 17 April 2018.